Preity Zinta is likely to be declared the heiress to Shandar Amrohi, who is one of the co-owners of Kamalistan Studios (worth Rs 600 crores) that originally belonged to Meena Kumari and Kamal Amrohi. It is said to be a prime property, being eyed by several builders. There is a strong rumour that suggests that at some point Preity will sell some part of her IPL stake and redevelop the Kamalistan property along with a high-profile builder from Pune. Read the rest of the article, Preity Rich Zinta is worth more than ‘1000 cores’. The Asian Development Bank (ADB) has shown interest in providing loan to PCMC Infrastructure Company Private Ltd, the special purpose vehicle (SPV) floated to implement different projects under the mass transport system, especially the Bus Rapid Transport System. The PCMC under the Jawaharlal Nehru National Urban Renewal Mission (JNNURM) has approved the two BRTS routes— Aundh-Ravet and old Mumbai-Pune Road. Read the complete article, ADB may fund PCMC projects. The Pimpri-Chinchwad New Township Development Authority (PCNTDA) will now be able to develop around 16 hectare land in Chinchwad and Wakad villages in the Pimpri-Chinchwad township as the landowners, who had demanded that their land is excluded from the PCNTDA limits, have lost their cases. The state revenue department in 2004 had issued an order that 3.94 hectare land in survey no 208 and 6.46 hectare land in survey no 209 in Wakad village is excluded from the PCNTDA limits. The PCNTDA had challenged this order in a writ petition at the high court in 2004. The high court first stayed the order and later cancelled it after the final hearing. The SC has given a verdict in favour of the PCNTDA. Read the TOI article, PCNTDA wins land cases. PUNE, April 15, 2010: Pharande Spaces, a leading construction and development firm that develops township properties in the PCMC area of Pune, India, has announced the launch of an exclusive thought leadership blog on this burgeoning real estate investment corridor. Considering the relative newness of Pradhikaran on Pune’s real estate investment landscape, the information so far available on the internet is sketchy and conflicting. Anil Pharande is confident that www.punepropertyblog.com will go a long way in setting the record straight, and in helping those looking at real estate investment properties in Pune to make more informed decisions. Pharande Spaces are amongst the most dynamic construction companies in the Pradhikaran area of Pune, with several landmark integrated township projects (including the award-winning Culture Crest) to their credit. Recent launches which have attracted widespread attention are Woodsville and, in a joint venture with The Rama Group, Celestial City. Address: Pharande Spaces, Sneh Leela Chambers 2nd Floor, 1237, Apte Road, Shivajinagar, Pune-411004.India. The Pimpri-Chinchwad Municipal Corporation (PCMC) seems to be displaying better financial wisdom than the PMC in Pune when it comes to spending on “non-essential” matters. The PCMC has slashed spending on various birth anniversaries of national leaders by 30%, terming it as “non-essential” expenditure. Read the rest of the article, PCMC cuts down on ‘non-essential’ costs. More than 600 citizens in Pune resolved to dedicate one hour every week to improve the city’s environment on Sunday. The first activity they will undertake is the cleaning up of all the 150 nullahs that flow through the Pune and Pimpri-Chinchwad Municipal Corporation limits. The first ‘Pune Resolve Conference’ held at Garware college on Sunday was organised by Samarth Bharat Vyaspeeth (SBV). Around 100 NGOs working in health, education, public governance, environment, transport, river conservation and bio-diversity participated. Read the rest of this TOI article, Citizens pledge one hour every week for city. State Home Minister R R Patil on Sunday said that he will form a committee to study the feasibility of reviving 150 closed police chowkies in the city for increasing the police presence to enhance security situation. Patil was in the city for a meeting with elected representatives of political parties and top government officials at the police commissionerate to review the law and order situation. Mayors of the Pune Municipal Corporation (PMC) and Pimpri Chinchwad Municipal Corporation (PCMC) were also present in the meeting. Read the rest of the Sakaal Times article, Govt may reopen 150 city police chowkies. The High Court restrictions on tree cutting has put the garden department of the Pune Municipal Corporation in a tight spot. To avoid trouble due to obstructive trees in monsoon, the department has asked citizens to file their applications for tree cutting immediately. The process of cutting trees, which pose a danger to life and property, is usually taken up by the civic body at the onset of monsoon. But since May 2009, the HC has made it mandatory for the PMC and citizens to seek its permission before cutting any tree in the city. Citizens can call the garden department on 25538553 or 25532514 or send their applications with a photograph of the tree to be felled on the address: The Garden department, PMC, Sambhaji garden, J M road, Shivajinagar, Pune 5. Read the rest of the TOI article, PMC invites applications for tree cutting. Come May 1 and residents of Pune, Pimpri-Chinchwad and the surrounding rural areas will begin to participate in the National Housing Census and National Population Registry drive. All residents of Pune district will have to fill up two questionnaires with 50 questions when the enumerators conduct the house-to-house survey. They will seek data like names of family members, age, income, education, standard of living and property details. A photograph of every family member above the age of 15 and their finger prints will be collected. Read the rest of the TOI article, Govt machinery shifts gear for May 1 census exercise. With many tempting locations featuring properties for sale in Pune, what does it take to make a new one stand out? Aundh, Wakad, Baner, Pimple Nilakh, Pimple Saudagar and similar areas have had their heyday. Now, it is the turn of Ravet, which lies on the North-West side of Pimpri Chinchwad Municipal Corporation and Pune. This location is set to become the new paradigm of investment property in Pune. Various significant real estate market drivers have combined to make Ravet the most promising destinations for Pune residential property. With its development masterminded by the Pradhikaran-Pimpri Chinchwad New Township Development Authority (PCNTDA), Ravet enjoys the benefit of an extremely strategic location on the Pimpri Chinchwad map. It is, in fact, the first town that appears on leaving the Mumbai-Pune Expressway. This has resulted in it becoming known as the Gateway to Pune; but that is not all there is to it. Ravet is a junction of the old NH4, the Katraj-Dehu Road bypass and the Mumbai-Pune Expressway and is placed advantageously close to the Hinjewadi IT hub and Pimpri-Chinchwad industrial belt. The residential property investment potential at Ravet is further enhanced by the fact that J.N.N.U.R.M has begun construction of a 45-metre, grade-separated, non-signaled four-lane BRT (Bus Rapid Transport) road at this point. This road, with 40% of the work already completed, will ensure that key area such as Aundh, Pimpri, Chinchwad, Chakan and Talegaon are in easy access from Ravet. Pharande Spaces and the Rama Group have joined hands at Ravet in launching an integrated residential township called Celestial City. In Pune, township properties are definitely the lifestyle wave of the future. This integrated township, spread over 2.5 million square feet, features futuristic facilities aimed at making it entirely self-sufficient and is going to be developed in three phases. Since the highest demand in Pune is currently for affordable housing, the first phase targets the middle-income group with 2/3BHK flats ranging in size from 800 to 1200 square feet. These flats are currently priced between Rs. 24 to 34 lakh at the initial offering phase. Taking a cue from this pioneering project, other developers have also acquired land in Ravet, although their projects are yet to be announced. While Ravet’s accessibility is certainly one of its biggest real estate market drivers, it also has a number of very important establishments in its immediate vicinity. These establishments will ensure that any township properties in this area will thrive. Among them are the famous Aditya Birla Hospital, industrial giants such as the Bajaj Auto manufacturing plant, SKF and Telco, as well as important education establishments like the Indira Institute of Business Management, D.Y. 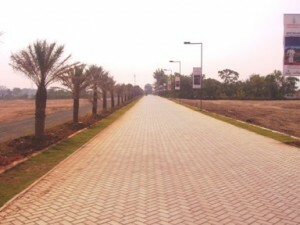 Patil College and Mercedes Benz School. Of course, the fact that Ravet is so close to the Hinjewadi IT hub is a major factor in terms of real estate investment potential. Ravet, with its upcoming integrated township, will now offer affordable residential property options for software employees from this software hub, as well as to those from the Talegaon MIDC and Chakan MIDC. As of now, property rates at Ravet are still extremely rational. Rates at township properties tend to be slightly higher owing to the fact that they provide their own infrastructure. Because of this, the appreciation potential for properties in such townships is also much higher than in other projects. Anil Pharande is President of CREDAI PCMC and Chairman of Pharande Spaces, a leading construction and development firm operating in the PCMC area of Pune, India.